Kimberly Darby works in OSHA’s Office of Communications in Washington, DC. For more information, please visit OSHA’s website at www.osha.gov. 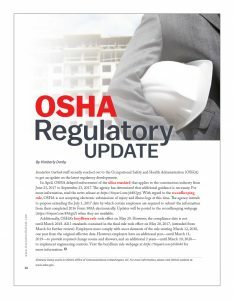 Insulation Outlook staff recently reached out to the Occupational Safety and Health Administration (OSHA) to get an update on the latest regulatory developments. In April, OSHA delayed enforcement of the silica standard that applies to the construction industry from June 23, 2017 to September 23, 2017. The agency has determined that additional guidance is necessary. For more information, read the news release at https://tinyurl.com/yb8b3grj. With regard to the recordkeeping rule, OSHA is not accepting electronic submissions of injury and illness logs at this time. The agency intends to propose extending the July 1, 2017 date by which certain employers are required to submit the information from their completed 2016 Form 300A electronically. Updates will be posted to the recordkeeping webpage (https://tinyurl.com/k9dcpj2) when they are available. Additionally, OSHA’s beryllium rule took effect on May 20. However, the compliance date is not until March 2018. All 3 standards contained in the final rule took effect on May 20, 2017, (extended from March for further review). Employers must comply with most elements of the rule starting March 12, 2018, one year from the original effective date. However, employers have an additional year—until March 11, 2019—to provide required change rooms and showers, and an additional 2 years—until March 10, 2020—to implement engineering controls. Visit the beryllium rule webpage at https://tinyurl.com/y8s8e4cl for more information.